Are you still trying to fight for iPads in your school? Many obstacles that iPad cynics attempt to put in place when discussing a roll-out are based on untruths, poorly research and/or out-of-date information. I was delighted when my Canadian Twitter friend and fellow iPad blogger, Steve Lai decided to join forces, as we’ve done before, to combat this dis-information that floats around the education profession worldwide. 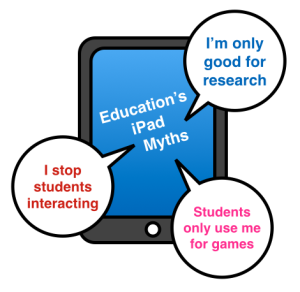 This Post explains how to argue a Case for iPads in the Classroom. Preamble: This article is to support iPads in teaching. However, it is not to devalue the benefits of a great teacher. The execution of iPads in class is only going to go as far as the passions and mindset of the teacher allows it to. In other words, the iPad will never replace quality teaching.